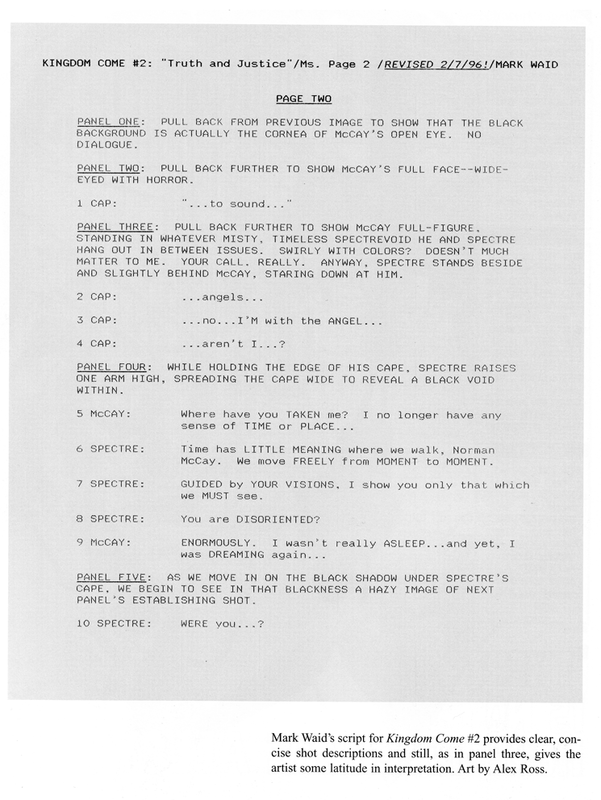 I love reading scripts but sometimes the writer seemed to be making up the format as they went. I often found it difficult to make out what information was describing the action, what was a line of dialogue, who was saying which lines, what was background information unnecessary for the reader but potentially interesting for the artist, what was direction for the artist, etcetera. Needless to say, reading those scripts was not fun. A script is not just words on paper. A script is a visual experience for the reader. A script is like a map for your story. The pictures and symbols on a map do not hold a candle to the actual experience of the trip, but reading a map can either be a simple, pain-free, enjoyable process for the reader that leads them from spot to spot along the journey or it can be just plain awful. The last thing that we want as writers is for our reader to get lost using our map. This is why formatting your script in a clear, easy-to-follow way is so important. Fortunately or unfortunately, a standard format for graphic novel scripts does not exist; at least, I haven’t found it. Depending on your intended approach to producing the comic, there are many accepted ways to approach formatting. In the 1960’s, Stan Lee was responsible for writing more than 50 stories a month. 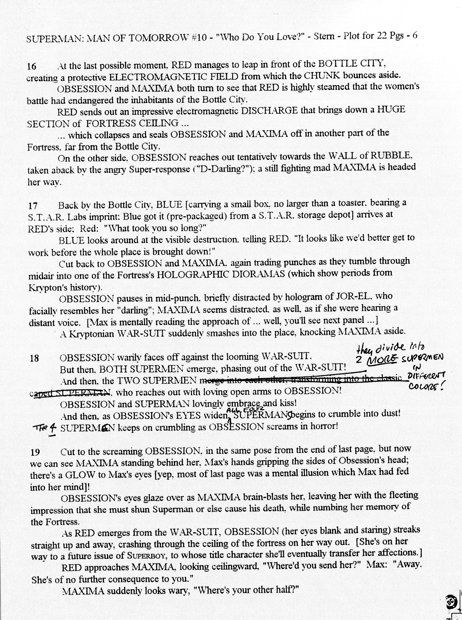 To take the pressure off his shoulders, he would write a short paragraph of plot for each page of the comic and leave the comic artist to design the page. Only after everything was drawn did Stan write the dialogue for the story (which is why so much of the dialogue is expository – used to convey information when there was no room to do so visually). If you prefer the opposite, hands-on, side of the spectrum, consider Alan Moore’s scripts, which rival the length of most novels. Moore wrote pages of prose for each panel, describing every element of every image in perfect detail. Needless to say, this approach offers the writer more control of the story and more responsibility. The best type of artist for this collaboration would be someone who just wants to draw and would appreciate all the homework you put in to make every last detail count (and doesn’t mind reading a lot). When developing my own approach to writing scripts for graphic novels, instead of making formatting decisions based upon whomever I would be collaborating with – since I rarely know who that person will be until I have finished writing the script – I utilized my time spent as a reader of poorly formatted script submissions as my primary influence. First and foremost, instead of using two or three script pages to describe one page of comics or one paragraph to describe five pages of comics, I try to have all of the panel descriptions and dialogue for each page of comics to be on each coinciding page of script. 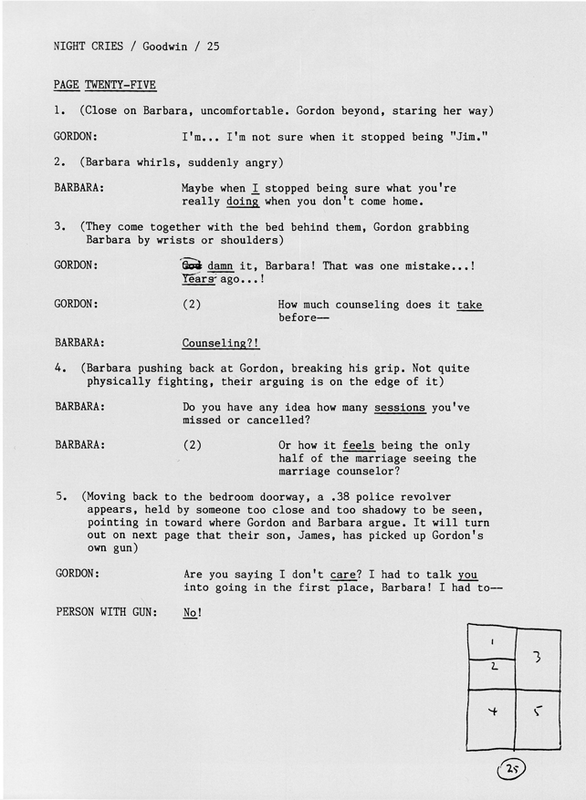 Everything that happens on page one of the comic is written on page one of the script. The same with page two and so on. On the same note, I also arrange the pages during printing so that the even numbered pages (which are always on the left-hand side) are printed on the left-hand side and the odd numbered pages are on the right. This allows the reader to get a more accurate feel for pacing. For example, instead of imagining when the page turns take place, the reader actually turns the page on the page turns. Second, I don’t separate thumbnails from the script. If thumbnail images are on a separate piece of paper, requiring the reader to turn their head back-and-forth to find the text that coincides with the image, they can easily get lost and frustrated. Having thumbnails on separate sheets of paper also requires more sheets of paper to be carried and kept organized. A 200-page script and two hundred pages of thumbnails is a lot of paper to lug around. To address this, I adopted the format in the picture to the left and placed the thumbnail on the script page. Working in Microsoft Word (a software that the majority of people have access to and know how to use), I use the square tool bar to make small boxes and place them in the top right hand corner of the page. These are now my rough thumbnails. It’s not perfect, sometimes those boxes can be difficult to maneuver but it’s better than any alternative I’ve attempted, thus far. (To the right is an example from Archie Goodwin, who drew his panels in by hand — though, I would advise against putting them in the bottom right; readers generally tend to look top right before bottom right). Lastly, I want the reader to be able to glance at my script and visually register the difference between a description of action, a line of dialogue, a character name, anything and everything they would need to know. Eventually, my hope is that they will forget about all the design work I’ve done and simply enjoy the story. With all this said, I do not consider my suggestions to be the end-all, be-all. Much like the work samples above, my format works for me, and it’s still evolving. If something else works for you, please share it, I’d be up for trying something new. Matthew Holm (illustrator of the Babymouse series) quoted this post on his blog and added a description of his own process. Thanks, Matt! This was a great little lesson! I’ll definitely be using some suggestions you made. Thanks! Hey, thanks for this! I have had an idea for a novel that i think will translate much more effectively into graphic novel format but didn’t know how to go about a script format. Thanks so much, especially for showing the different examples! THANK YOU! THANK YOU! THANK YOU!!! You answered all of my questions in a quick, neat tutorial. I’ve been needing this information for a long while! You’re so very welcome! If you know anyone else who could use this info, please spread the word. Just download celtx. It gives you a comic book script format and you just write away. Just for anyone that’s interested, as said above, Celtx provides a good format for writing graphic novels, and so does Final Draft 8 – though I don’t yet know if the format of a graphic novel would differ from that of a comic. Interesting article….I was wondering which method is the most preferred by publishers? Good question, but unfortunately there is not a satisfying answer. At the present moment, publishers have not expressed a mass preference. An individual publisher may have guidelines on their website or an editor may express a preference once they are working with you, but for the most part publishers except any of the formats above or anything you create as long as the information is written clearly. when writing the graphic novel should we have a page discribing the apperance of the character? Since we arent writing a novel. I’ve seen it done both ways. A page of character descriptions at the beginning of the script — like a stage play — is fine. But I don’t recommend it. When I read scripts, I skip character description pages. By the time a character is introduced in a story, I have often forgotten their description before page 1 and rely on their actions and dialogue to tell me who they are. (And if I can’t gather who the character is by what they do, a character description page is moot, anyway). CLOSE on the face of RICKY FITTS, illuminated by the screen of his DIGICAM as he videotapes. Ricky is eighteen, but his eyes are much older. Beneath his Zen-like tranquility lurks something wounded… and dangerous. RICKY FITTS (18): Has a Zen-like tranquility about him. His eyes are much older than his age and his gaze appears both wounded and potentially dangerous. Likes to use his video camera to record moments in life that strike him as beautiful. After reading that I’d have to wait until Ricky appears – many pages into the story – to understand why any of that information was important. Better to just hit me with it in one moment than hope I remember the character description by the time the character is introduced in the story. I love you’re advice, it is always helpful. 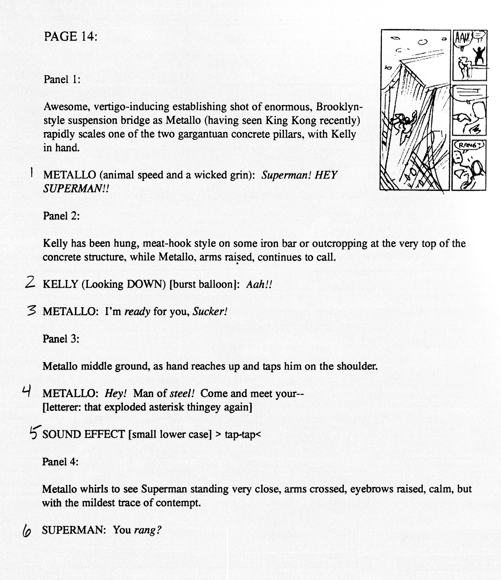 Can I ask you how do I discribe dream sequence in a graphic novel script? Is This correct? I’ll use batman as an example. Side view of Batman shirtless sleeping in his bed. Fuzziness around edges- batman is hand cuffed and chained to a chair, face down, sweating and dazed a bright light hovers over him. the joker pulls back batmans hair pressing his cheeck agianst batmans. whats wrong batsy, the little bright light hurting you’re bat eyes? Im going to skip to the part where batman wakes up. Damn that joker, It was olny a dream. Thanks for reading, Ayden! I’m glad I could help. The sample you’ve written here is technically fine. It’s clear that Batman is having a dream and the description leaves a lot of room for the artist to play. I’d have to see the rest of the script to make constructive comments about the content, but if you want to add more description to give a feel for the DARK ROOM, that would elevate my reading experience. What kind of room? There would have to be some source of light to see anything, so where is light coming from? Is it soft light? Dramatic light with lots of shadows? Is it dank? Are there rats? Can I see the sky? etc. Little details like that can add a lot. Of course, you don’t have to add any of that; you can let the artist make those decisions. “Fuzziness around the edges” is a little unclear. Are you saying that the panel borders are fuzzy? Or are the panel borders normal with blur lines within them? That helps alot! Thank you so much! I’ve been telling my friends about you’re site and they love it! “Fuzziness around the edges” is for the borders, yes. But I’ve also made an artist note letting the artist know that its a dream..I’ve also suggested faded color. I appreciate you’re time and feedback Tim, I will contiue to let people know about this site. Hello! I know it will differ but roughly how many pages does the average graphic novel script have? And do places accept just a script? Thanks loads! Hey Madeleine! Thanks for the comment. You’re right. Page count does differ depending on the project. As you’ve probably noticed in book stores, mainstream comics tend to have 128-256 page graphic novels because they are collections of 4-8 issues of 24-32 pages each. And stand alone graphic novels are typically 150-300+ pages. So, unless you intend to do a 1,000+ page graphic novel, I wouldn’t worry about page count. (If you are planning to do 1,000+, well… I’d recommend trying to split that up into issues or chapters or into a trilogy — easier bites for publishers to swallow.) As for accepting just the script: some do. Some publishers want a completely finished book before they publish while others are willing to take a script — best to ask them individually. And it’ll definitely help to have well-drawn, well-suited visuals to accompany the script. Even if it’s just the first ten pages, or finished character sketches. An image is worth 1,000 words, and when a GRAPHIC NOVEL publisher has to choose between a 200-page script of just text or a 200-page script that has comics accompanying it, of course they will want to read the latter. I hope that helps! Thank you so much, you’ve been really helpful! I’m going to add your comment to my writing blog if thats OK? I’m not stealing your words! That’s absolutely okay. Thanks, Madeleine! I’m working on a graphic novel now. I was concerned if their was a specific format, but now your post has helped clear that up. I plant to be the writer and the illustrator. I can see the images in my head, the only difficulty I foresee is dialogue. Thanks for your post. You’re very welcome! Thanks for the comment. Good luck with your project. Hello Tim. It’s been a while since this article was written, but I was wondering–I wrote up a screenplay for Film that would make a terrific graphic novel. However, it’s 130 pages. Do you see me having to convert every page into the guidelines Dark Horse for example advises? It’d be an arduous task, certainly ominous. Hey Anthony. It depends on who you are trying to please. If you are submitting to a publisher then read the submission requirements for that publisher in detail. Dark Horse doesn’t mention adapting a screenplay into graphic novel script format, specifically, but they do direct writers to their script format link more than a few times and they say “You can download our Script Format Guide on which to base your script format” in section 3 (http://www.darkhorse.com/Company/Submissions#writers). You can submit whatever you want but my guess is that they prefer to read their script format, and since they are the ones you are trying to please I’d just bite the bullet and do it. On the other hand, if you’re trying to please an artist then they may not mind screenplay format. Nice post. It really helps, I never considered that you could do so many different formats. I just found this site online today and it couldn’t have been at a better time. I ran into a problem. I’ve been writting a story and attempting to make it into a graphic novel or comic book; maybe even a novel because its pretty unintentionally long haha. I was curious what your thoughts were regarding an ensemble cast of essential characters when writing the plot and/or story? How do you keep the story from getting too bloated, when there’s a few plot points & story arcs going on, each person with a their own back story that eventually intertwine. Thank you and would love to hear your ideas at your earliest convenience. Are you (or anyone on this thread) familiar with Final Draft Pro? I confirmed that one of the templates in the current version is “graphic novel” but can’t find what that looks like without first buying the software. The software looks super useful, but with only one graphic novel template (out of 100 templates), I’m curious what format that is specifically. 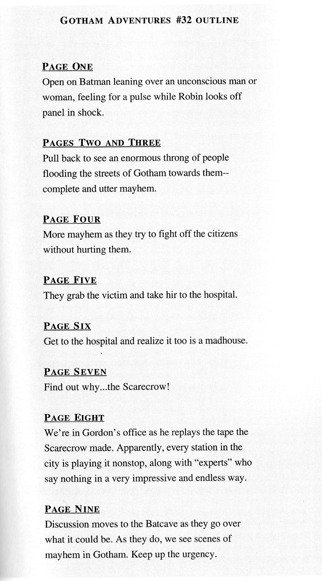 Personally, I really like the concept of one script page per graphic novel page. I am familiar with Final Draft Pro. I’ve owned it in the past. It is the current industry standard for screenplays (however, that is gradually changing due to more inexpensive software options on the rise–you can hear a conversation about that between professional screenwriters and the makers of Final Draft Pro here: http://johnaugust.com/2014/the-one-with-the-guys-from-final-draft), so if you want to write screenplays as well as graphic novels, then go for it. If you want to write graphic novels, only, don’t bother. It’s expensive and publishers don’t require it. You can buy Microsoft Word for less money and it’s far more versatile. That’s my two cents. Thanks, Tim. I appreciate the quick response! Hello Tim… thank you for your post. It’s been extremely helpful. I have a 2-part question for you. 1st… I’m a writer with little to no contacts as far as graphic artist are concerned (and I can’t draw/ sketch worth a lick).. so my question is, I’ve read different instructions pertaining to the writer of a graphic novel giving panel instructions to the artist (ex. : Med. close view of Dora’s left hand/ WIDE shot of man looking down on the city, from the ledge of a tall building)… From your experience, do you suggest doing the same thing, or should the focus strictly be on the action/image the viewer is looking at, and leaving the panel size up to the artist? Secondly, for an unpublished writer, do you find that it’s absolutely necessary to have a finished product when writing something that will probably have 5 – 6 editions… or ultimately is the strength of ones material based off of the 1st book enough to gather interest? 1) Ideally, it’s best to write to the artist’s strengths and adjust your style to suit them. But since your artist is yet to be determined, then I’d advise writing the script how the story feels. If the story has a simple plot, is light on emotionally complexity, and you are flexible to what the artist eventually produces, then write the description in the same way: light on the details, like the Marvel Method. If the story is dense and complex, and you are married to a specific visual outcome, then write out each panel in detail. Personally, I’m somewhere in the middle. I went to cartoon school and I know how to draw comics, so I usually have a specific visual outcome in mind. But I choose to work with artists who are better than me, so my descriptions become suggestions because I’m flexible enough to hear if they have a better idea. That’s why I write out each panel in the kind of detail similar to your provided example, Craig, “(ex. : Med. close view of Dora’s left hand/ WIDE shot of man looking down on the city, from the ledge of a tall building).” This is not Stan-Lee loose, nor is it Alan-Moore dense. It’s somewhere in the middle. 2) If by “editions” you mean five or six issues of 24–32 pages each, then just write the whole thing. But if by “editions” you mean five or six graphic novels of potentially hundreds of pages, then just write the first book. Publishers have been publishing book series based on the strength of book one for a long time, but don’t expect the publisher to buy the entire series from an unpublished author. If they’re interested, they’ll buy the first book and see how it goes. Hey, Tim. First off, I want to thank you for your information. I’ve been working on a graphic novel project of my own and I’ve had little information in the way of what other people do for script formatting in comics. The method I eventually settled on was much closer to the Alan Moore method. I have a pretty dense concept of what I want it to look like visually (though I’ve been having to temper myself in terms to panels since I seem to enjoy breaking them more than using them) as well as where the story is going. What I’ve been doing is essentially drawing empty panels for every page and including in them notes on the individual scenes. I really have a very clear vision of the pacing and the way the story moves. Each panels is mostly empty with a few lines of dialogue or exposition and sometimes sketches, and it’s accompanied by a sidebar that describes the scene in its entirety. My question is this: Should I accompany with a proper script? I’m working with a team, so I’m not the only person giving ideas and input into how the scenes hold develop and the pages should look, but we don’t have an actual artist yet to know what their style would be. Also, we were planning on releasing the first Volume of the six volume set for free on the internet when it is completed and then opening ourselves up to outside funding to help us continue making the rest of the series. We’re currently just starting on building our social media presence (fracturedbloodlinesmanga.tumblr.com), which we’re keeping active through notes and short stories set within the world of the graphic novel. Would it be smarter to try and sell to a publisher? And if I did, would we still be able to continue making it as our own team? I don’t want to lose creative control or the team of writers I currently have collaborating with me. Thank you for your time and I apologize for the heavy level of questioning. Hey, Tim. First off, I want to thank you for your information. My question is this: Should I accompany with a proper script? I’m working with a team, so I’m not the only person giving ideas and input into how the scenes hold develop and the pages should look, but we don’t have an actual artist yet to know what their style would be. What does your team prefer? What would be more/less helpful for them? Go with that. And when you get an artist, ask them what they prefer, and go with that. Would it be smarter to try and sell to a publisher? And if I did, would we still be able to continue making it as our own team? Thanks! This was great 🙂 We are doing a graphic novel project in my English class and I was looking for a good example to give to my students who don’t draw – this is it! Hello Tim, My dream is to have a comic book series .Thanks Tim for the info. i’m in the process of writing my first comic book. I’m like a baby in this huge world of comic book life, so this info gives me some insight in kinda tweaking my writing style to conform close to what format closely mirrors mine. I’ve learned just recently that the minimum page requirement for comic books is about 22 pages and 48 for graphic novels. Also Artists can be very expensive per page, i would love for this dream to come true someday but i know there is going to be many challenges. last but not least a slogan i have adopted is NEVER GIVE UP ON A DREAM! Is there a format that is better to use if I want the artist to have as much freedom as possible? I only want to tell the basic story and dialogue, then have the artist make the decisions about character looks, clothing, surroundings ( apart from story line requirements ) and background details. What format would best provide me the option to just say what is happening in the scene, then the dialogue of each character in the scene, without the need for anything specific regarding artistic expression of the artist? Then move into the next scene description and dialogue?